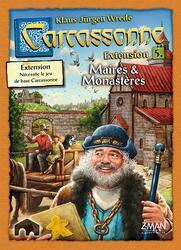 This fifth expansion in Carcassonne offers players many opportunities to increase their influence. Traveler merchants offer their goods to different cities and abbeys. Some cities in the country are now big enough to have their own mayor. Peasants establish large and wealthy farms while the Church tries to strengthen its influence by erecting imposing monasteries.